78 MMS March 2017 mmsonline.com FEATURE and Unplanned Downtime. The introduction of the Standby status helped LMI tease out the dif- ference between machines that were down and machines that were ready but not at work because of upstream holdups. This granularity in under- standing the machine status helped managers prioritize and make effective decisions to improve machine utilization, he says. Other benefits are also significant. For exam- ple, operators have created healthy competition amongst themselves by following the system's main dashboard, which is displayed on shopfloor monitors. Likewise, customized production rules and alerts based on toolpath feed-rate overrides and rapid override values have led to improved identification of production cycles. In addition, visibility to actual asset production utilization of machines has enabled LMI to provide more competitive bids to its customers. 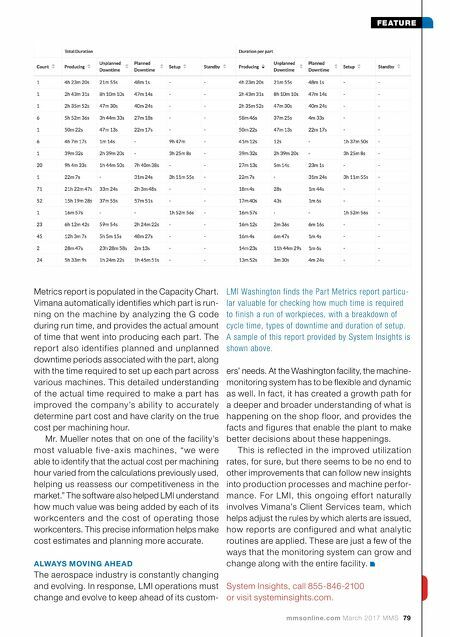 USING PART METRICS TO INCREASE CAPACITY Vimana's Part Metrics report gives detailed infor- mation about how a part was made, including information on the production and setup times involved. LMI Washington has been able to use this report to obtain an accurate part cycle time for its job-costing calculations. Workorders at this facility are typically one week in duration. The total time taken to make a part is compared across three categories—Estimated, CAM Analysis and Actual Runtime. The monitoring software provides actual run time, a calculation which helps improve estimates for upcoming workorders. 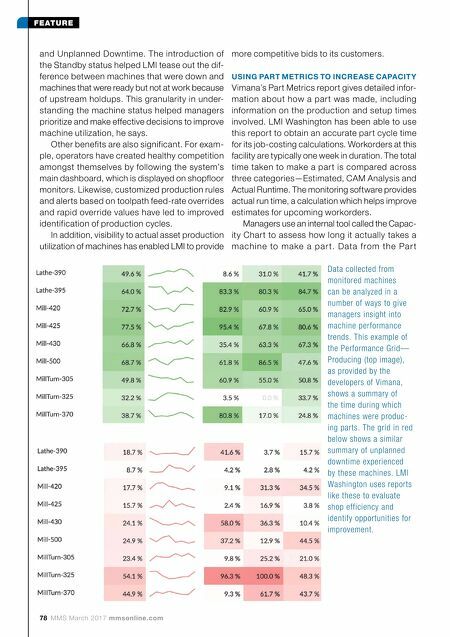 Managers use an internal tool called the Capac- ity Chart to assess how long it actually takes a machine to make a par t. Data f rom the Par t Data collected from monitored machines can be analyzed in a number of ways to give managers insight into machine performance trends. This example of the Performance Grid— Producing (top image), as provided by the developers of Vimana, shows a summary of the time during which machines were produc- ing parts. The grid in red below shows a similar summary of unplanned downtime experienced by these machines. LMI Washington uses reports like these to evaluate shop efficiency and identify opportunities for improvement.